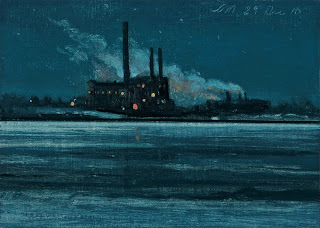 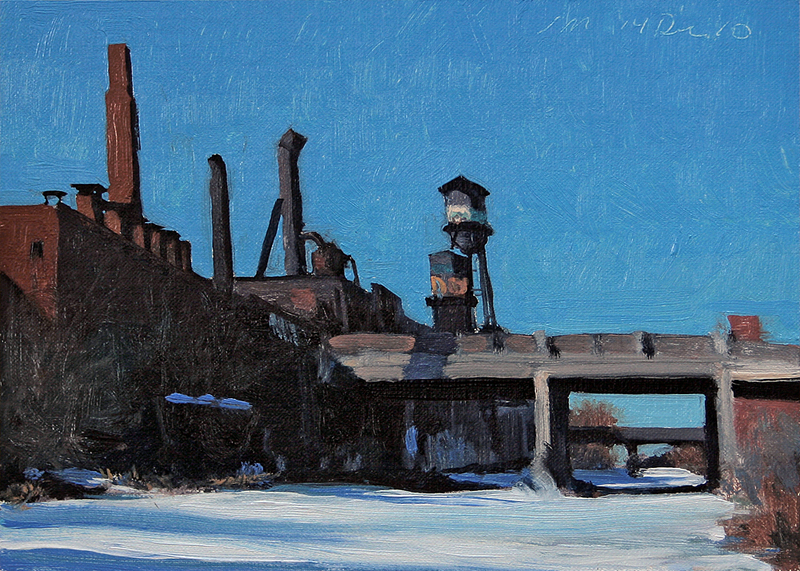 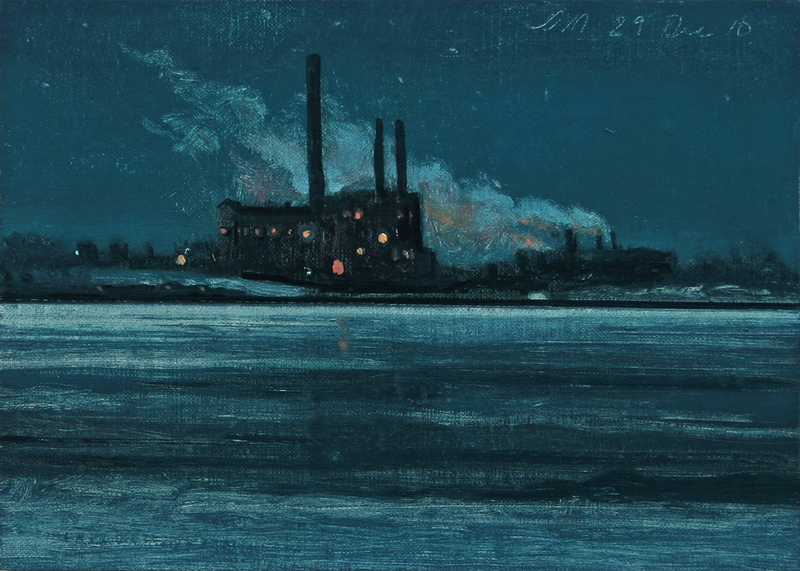 This daily painting is a winter landscape of the Central Ave Bridge on Belle Isle Park in the Detroit River. Wishing all the best for the NEW YEAR! This daily painting is a winter landscape on bright, crisp sunny day of the River Rouge with long shadows creating a winter wonderland of abstract shapes and forms. 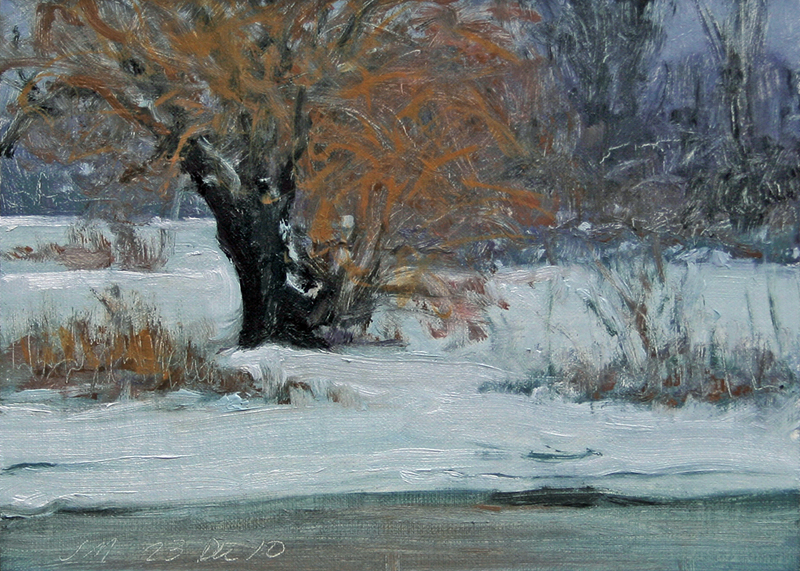 This daily painting is a winter landscape on Belle Isle of a wonderful old tree. 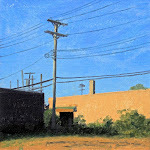 comments and encouragement on Postcards from Detroit. 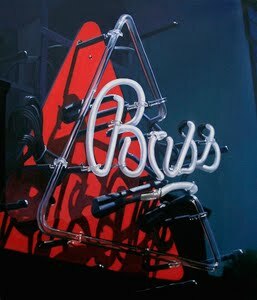 Your kindness has touched me in so many ways. 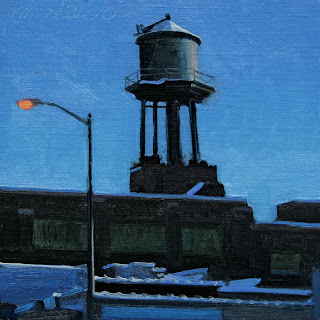 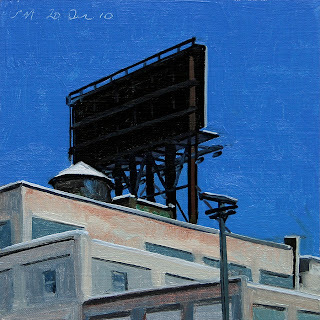 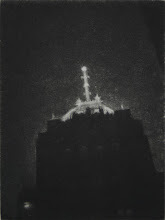 This daily painting is an urban landscape of a view of a snow covered water tank and rooftop. 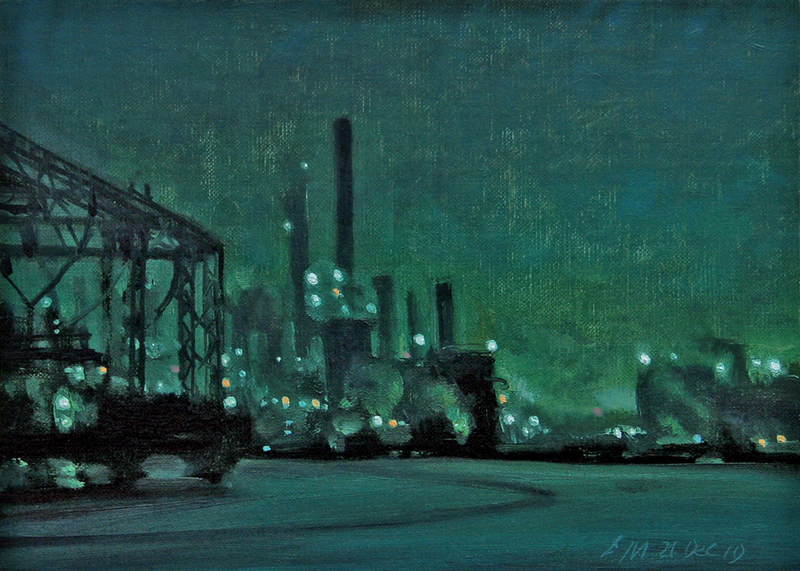 This is a view you see as you are driving into and leaving Detroit. 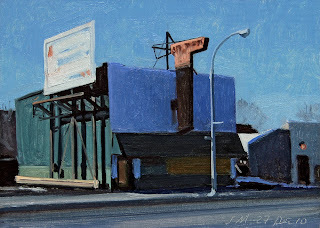 I painted a similar larger view in the mid eighties when I first stared painting Detroit scenes. 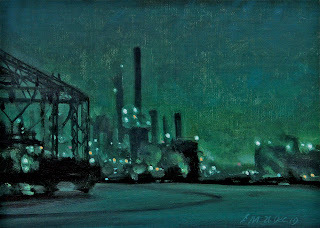 This scene still inspires me today. 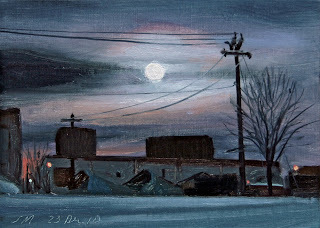 Happy Winter Solstice, Full Moon, Shortest Day Of The Year, Lunar Eclipse, Happens Once Every 4-500 Years Or So Day!!! 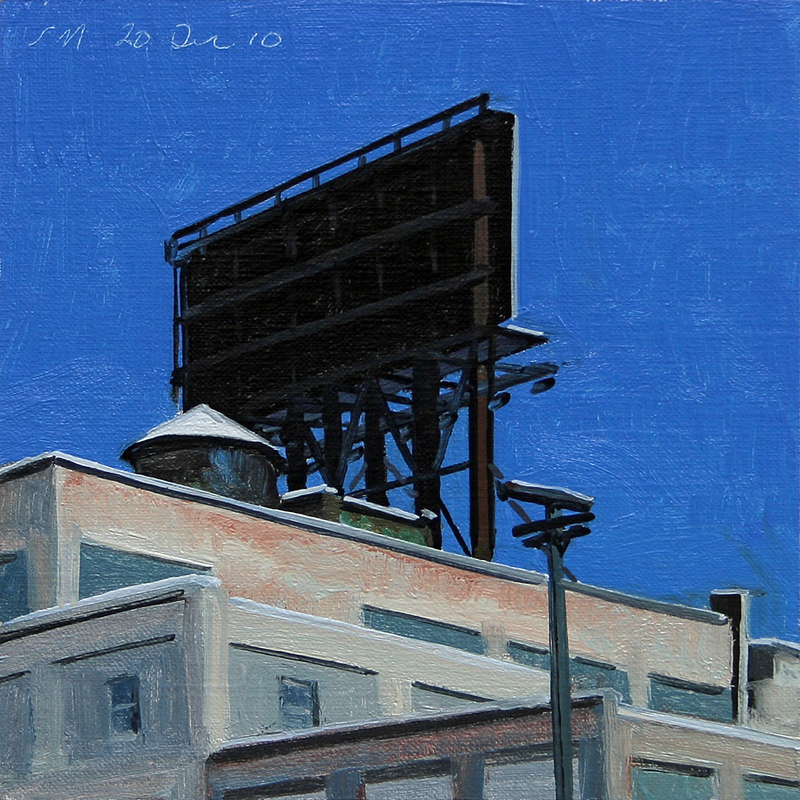 This daily painting is an urban landscape of a bright sunny day with deep blue shadows on the roof and on the snow. This daily painting is an urban landscape of intersecting roadways with the columns catching the last rays of fading light. This daily painting is an urban landscape of the Nancy Brown Peace Carillon Clock on Belle Isle on a crisp December day after our first snow. 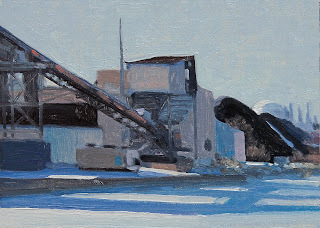 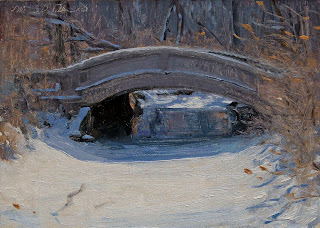 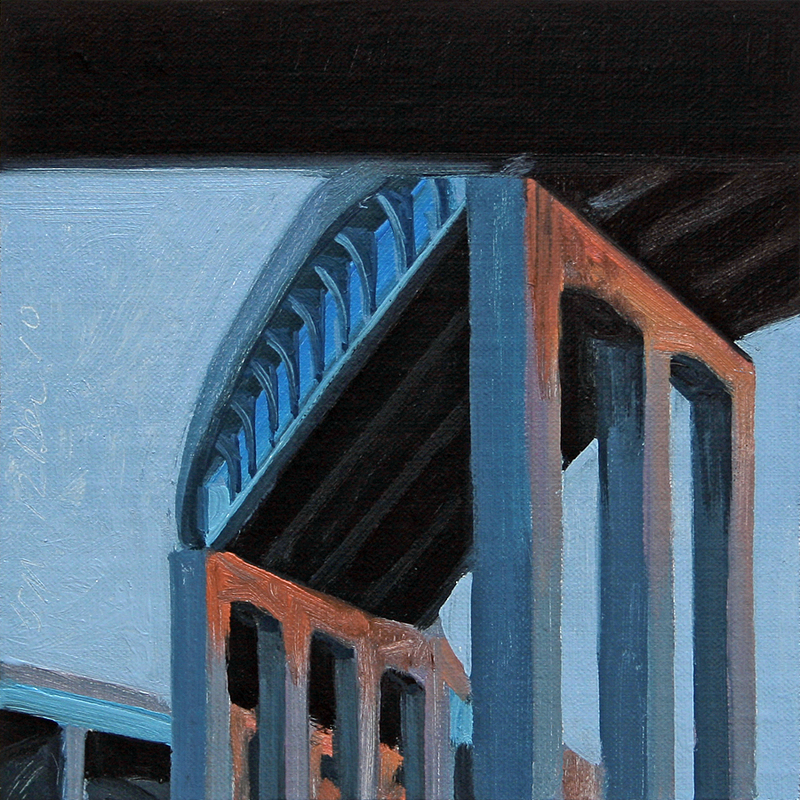 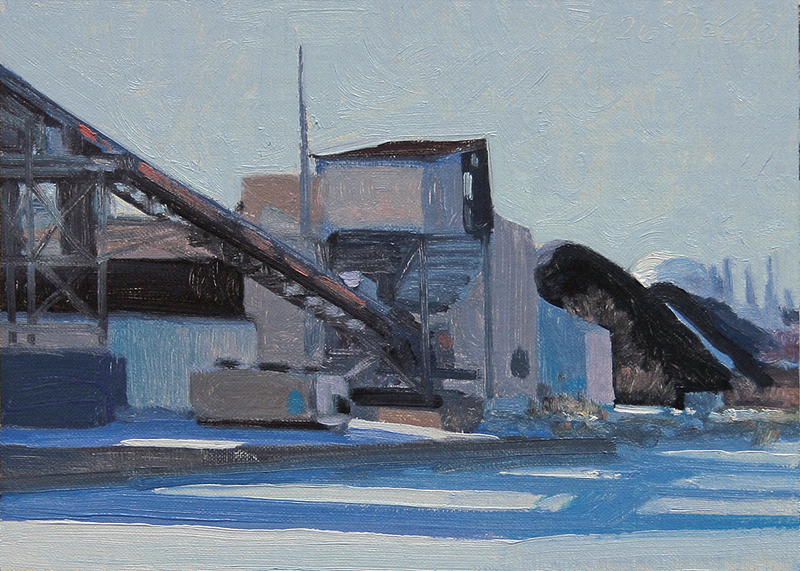 This daily painting is an urban landscape of a bridge and shadows on Belle Isle after our first snow of the season. 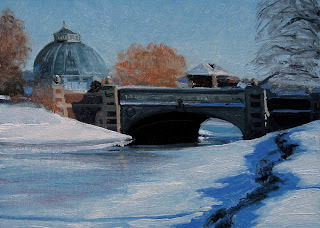 Behind the bridge is the Anna Scripts Whitcomb Conservatory (1904) a nice gem in the city. 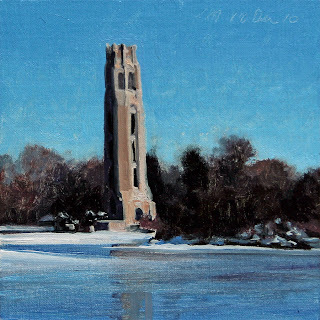 For some interesting history on Belle Isle click on the link. 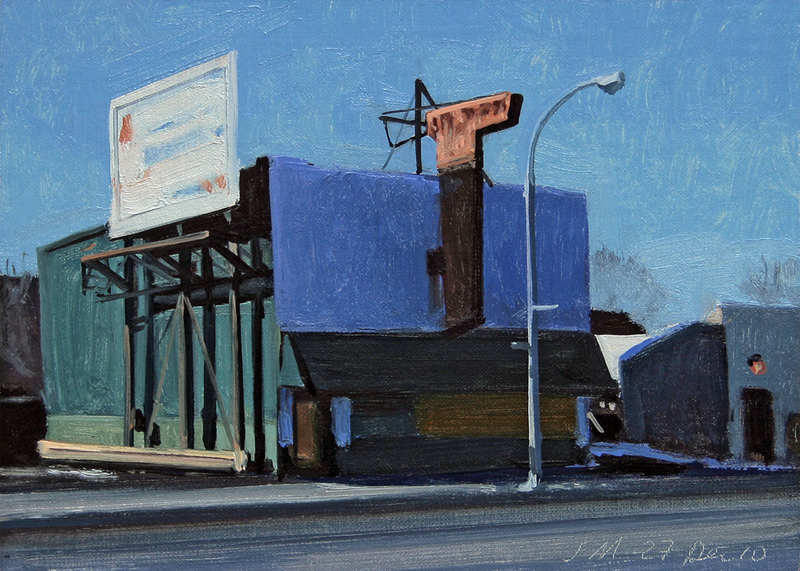 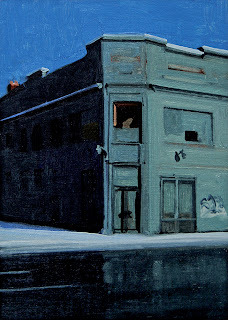 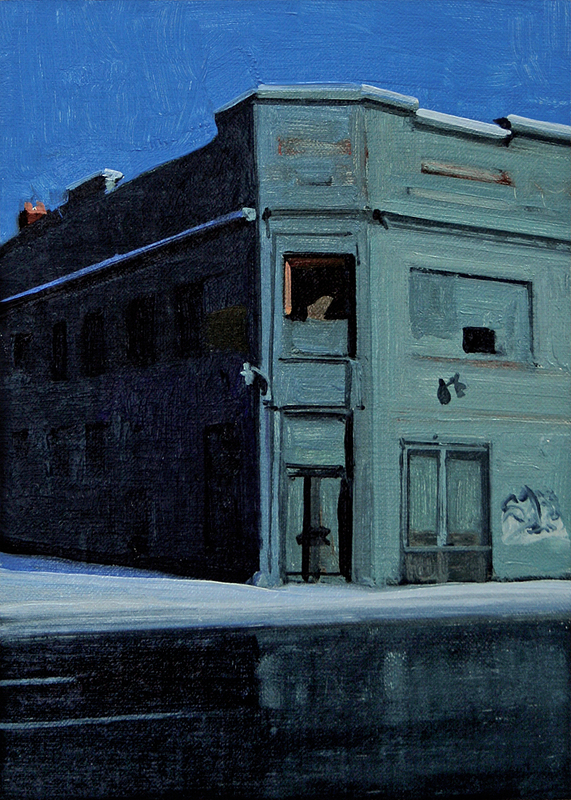 This daily painting is an urban landscape of a corner building on East Jefferson Ave. 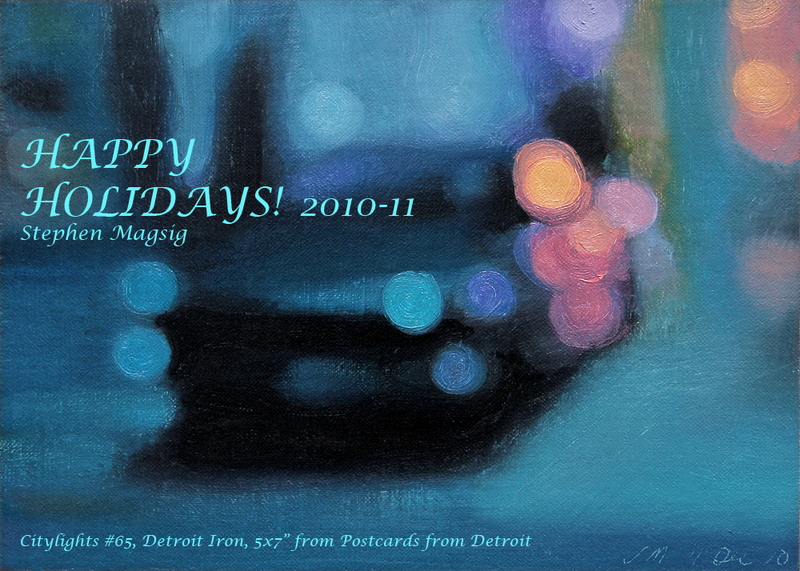 It is on the way to Belle Isle. 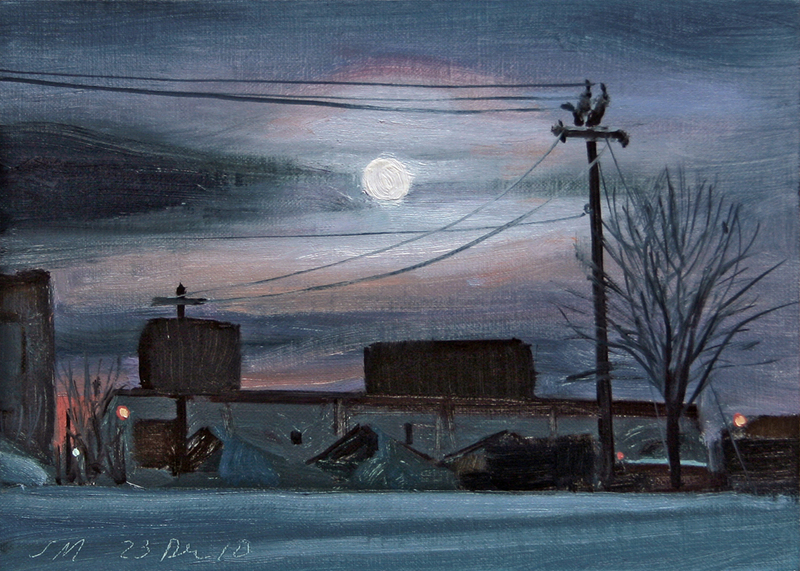 This daily painting is an urban landscape of the Dequindre Cut after the first snow of the season. 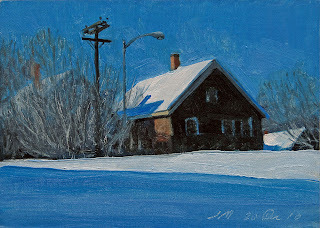 Yesterday and today are rare beautiful sunny days. 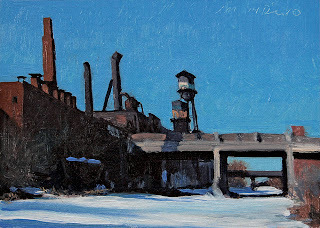 I spent half a day on Belle Isle shooting in the sweet sunshine.